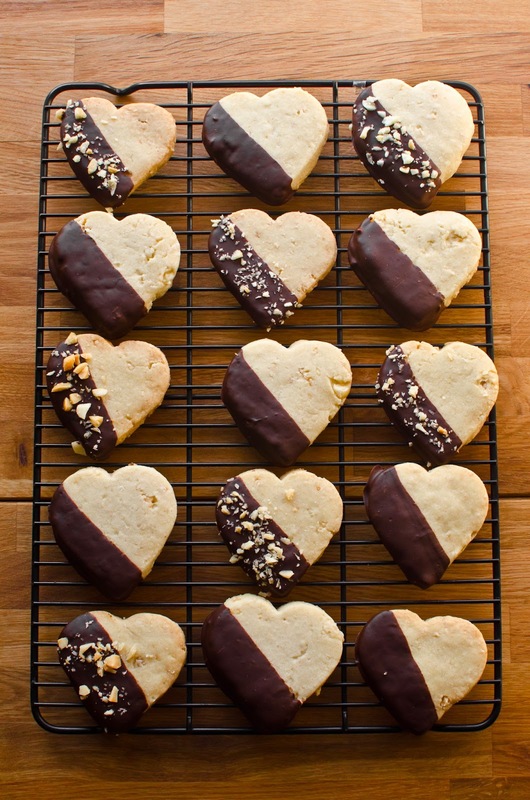 You may have noticed that I love posting recipes for Valentine’s Day. I swear I’m not one of those lovey-dovey cheeseballs. But, I can’t help but get excited about a holiday that’s semi-revolved around sweets. Frankly, I can use all the excuses I can to bake. And, uuum, eat. and His n’ Hers Ice Cream Floats. 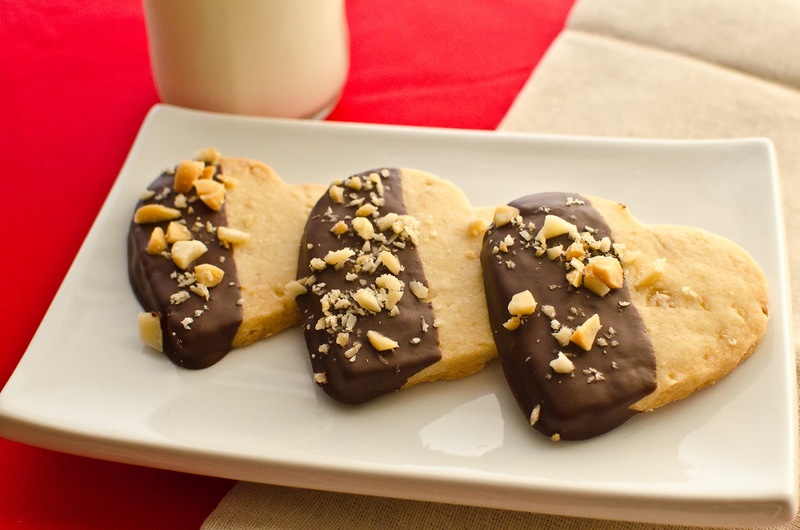 All of these were fun, but this year I recreated my Chocolate Dipped Macadamia Nut Shortbread recipe with a new twist: the sweet and tangy flavor of guava. And with that, I give you… drumroll… Guava Shortbread Cookies. Ta dah! Do you ever wonder what happens to all the food showcased on this blog? 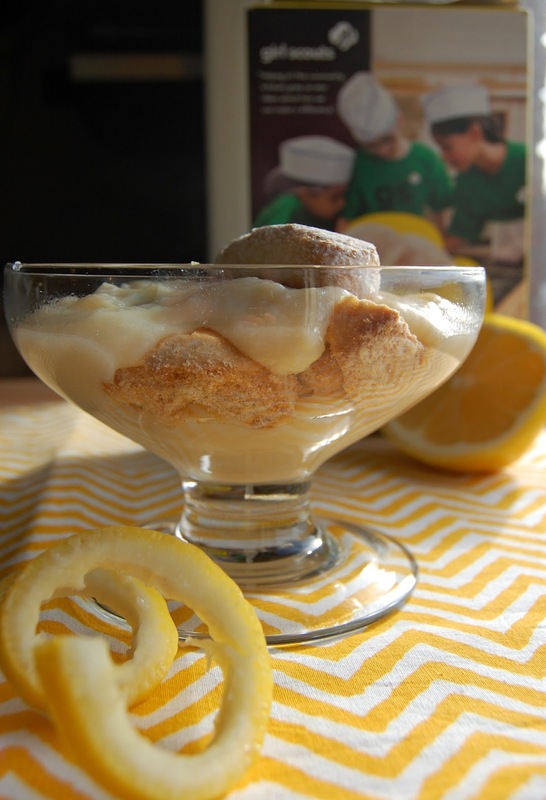 I absolutely hate to waste, but I’ve gotten in the habit of offloading many of my recipes – particularly bite-sized desserts, which have a habit of disappearing far too quickly. This recipe for Gluten Free + Vegan Chocolate Coconut Cookies was no exception, and I was happy to bring a tupperware o’ treats to share with my colleagues. Not only because Mondays are hard, and cookies make it better, but also because these cookies are simply delicious. If I do say so myself. How’s your day-after Thanksgiving food coma going? Mine is pretty intense! So much so that I’m ready to move on and talk about Christmas. Are you with me? I’m excited to share this delightful holiday recipe for Pistachio Cranberry Christmas Crisps. But wait – I have some explaining to do. See, this isn’t exactly my recipe. I’m participating in a Holiday Cookie Contest with Miss Maki of the Simple Kitchen. Miss Maki’s readers submitted their all time favorite cookie recipes, and she promptly distributed them (anonymously!) to several local bloggers. I’ll be making another batch of these and bringing them to the official taste tasting and winner selection on the Simple Kitchen radio program on Sunday, December 1. So tune in and see how these puppies fare. Regardless, I’ll tell you that they disappeared in my office in about… 30 seconds. So I think it’s a winning recipe, regardless. My parents divorced when I was just a baby. WAIT – this isn’t a sad story, so don’t leave. See, they both remarried and had more children. After a few years, my father moved from Oahu to the Big Island, and I became what he likes to call their “back and forth kid.” I spent weekends bouncing between airports to see my two families. Between the time I was 5 and 12, I flew as an “unaccompanied minor,” which meant my parents were able to walk me onto the flight (back in the days that your family could walk you to the gate, instead of leaving you at security. Remember that?!). Oh, and I had to wear those clip-on wings (which were embarrassing for longer than they were cool). Another perk was that I was almost always bumped to first class. See, when you’re a cute 5 year old with a Hello Kitty suitcase, and you fly every other weekend – and you’re probably the youngest member of the Aloha Airlines frequent flier club – flight attendants know you. In first class, the inter island flights used to serve little packs of macadamia nuts. I’d spend the 26 minute flight sucking on the salty macadamia nuts. I never actually ate the nuts, and I’m sure I didn’t spit them out so discretely. Gross, I know you guys. But kids are weird. I’m sure the flight attendants and the other first class guests – who had actually paid for their seats – thought I was a little nuts. Um, no pun intended. This wee little blog is only a part time hobby for me. Monday through Friday, I work full time as a social media marketer. And so it wasn’t a huge surprise for many of you when I posted pictures on Instagram last week of Facebook-themed cookies that I prepared for a team meeting. I am a foodie AND a social media geek, after all. Anyway, I instantly had lots of great feedback on the post – including someone asking whether I had actually made these cookies – so, I figured I’d share the recipe to show you just how easy (and delicious!) it is. Not only are these cookies pretty adorable, but they taste great. 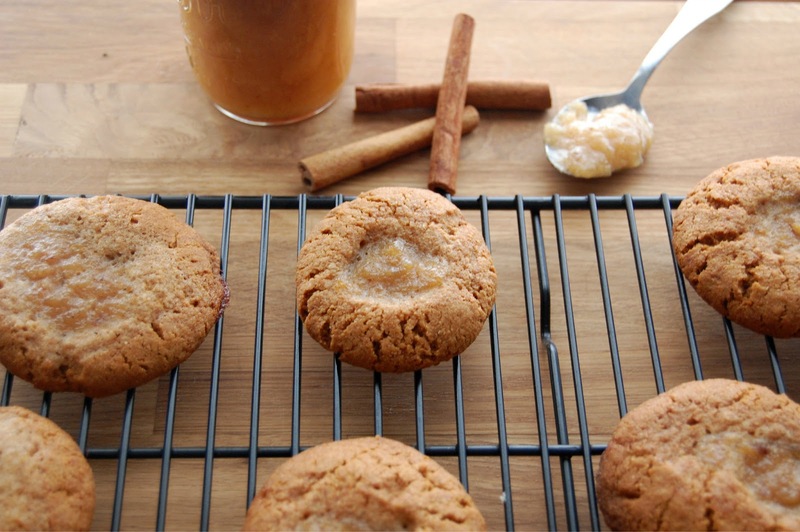 I’m not normally a sugar cookie fan – but these cookies are slightly addicting. So get out a glass of milk and your blue food coloring. You’re going to “Like” this recipe. A lot. I think I may be the only person in Portland without dietary restrictions. I swear, everyone here is either vegetarian or flexitarian or gluten intolerant… it’s like an episode of Portlandia. But real life. I recently made dessert for a get-together where I knew there would be vegan and gluten-free eaters. Now, I make tons of recipes that are gluten free. Or vegan. But not both – and I figured out why when I was trying to decide what to bring to the party. It’s hard to find a good recipe that follows both restrictions! 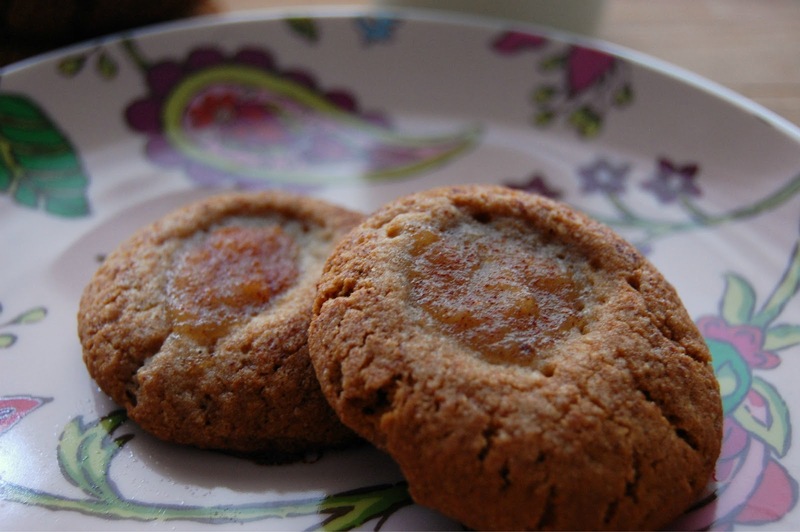 Luckily I found a yummy-looking thumbprint cookie recipe after some intense google searching, and put my own twist on it – including adding the homemade apple butter that I can’t get enough of. 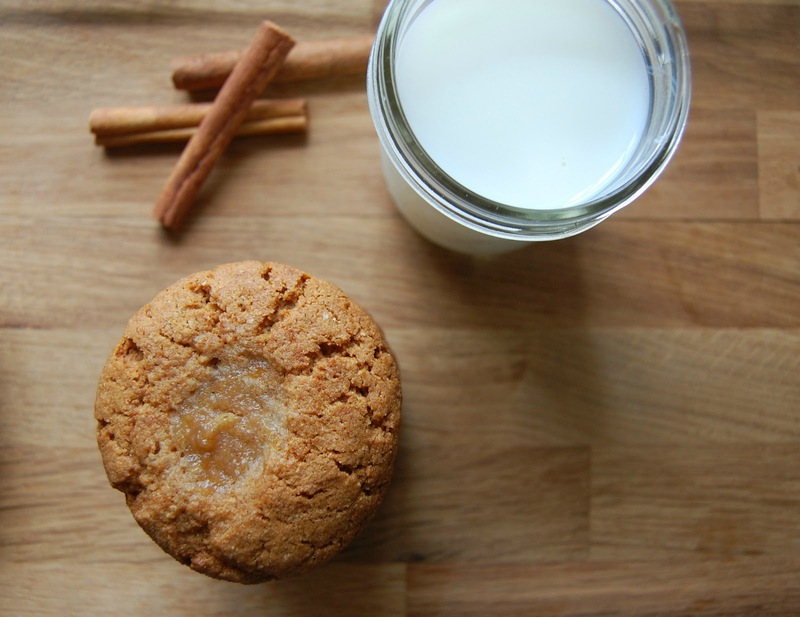 And seriously, you wouldn’t have known these treats were vegan or gluten free! They were a huge hit, and I can’t wait to make them again with different jam and butter flavors. Whisk together flour, baking soda and salt. Beat in shortening, sugar, vanilla, agave and egg replacer. Add in almond milk as needed to make dough smooth. Cover dough and let chill for 1 hour. In the meantime, line a baking sheet with parchment paper and preheat oven to 350F. Once dough is chilled, roll small balls of dough (approx 1 heaping T) and place on parchment paper-lined baking sheets. Gently press down on the ball with your thumb to form an indent, and dollop your apple butter – or jam of any kind – into the indent. Bake for 20-23 minutes until cookies are golden. Cool on a wire rack. 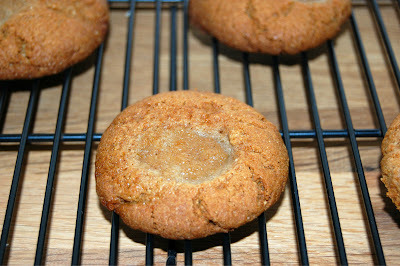 Recipe adapted from the Gluten-Free Goddess’ Thumbprint Cookies with Buckwheat Flour and Brown Sugar. 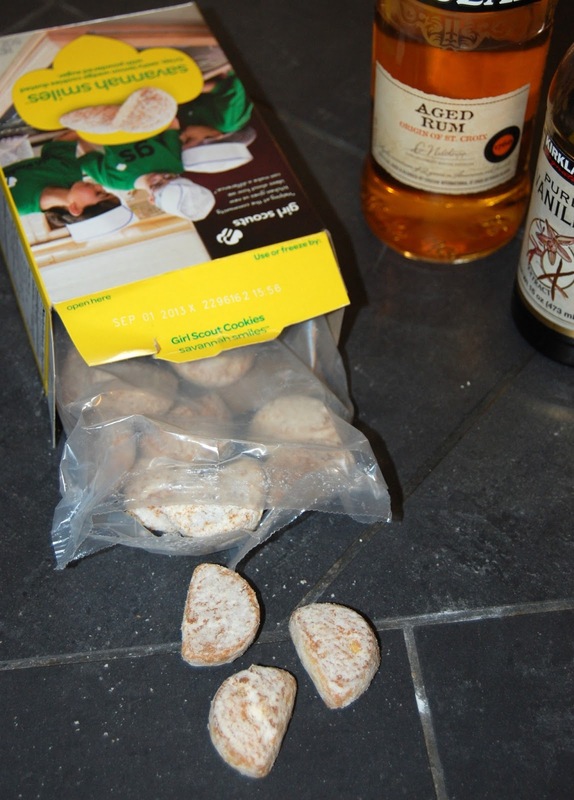 Does anyone have a trick for saying “no” to Girl Scouts? Seriously guys, it’s a problem for me every February. I’m a total sucker. From thin mints to tagalong, we’ve already purchased about a dozen boxes. And I’ve probably eaten about 11 of them. Bad news. But here’s the silver lining. I discovered a pretty scrumptious new recipe to make use of the cookies. You see, I figure the quicker we can eat all the boxes, the quicker they’ll be out of the house. Logical, yes? So here it is: lemon cookie trifle with vanilla rum pudding using the Savannah Smiles lemon cookies. On their own, these cookies are just a tad too zesty for me. So the rich vanilla rum pudding is the perfect combination to balance the citrus. Plus, I love the texture combination of the crunchy cookie and the creamy pudding. Bring 2 cups of the milk to a boil in a medium saucepan. 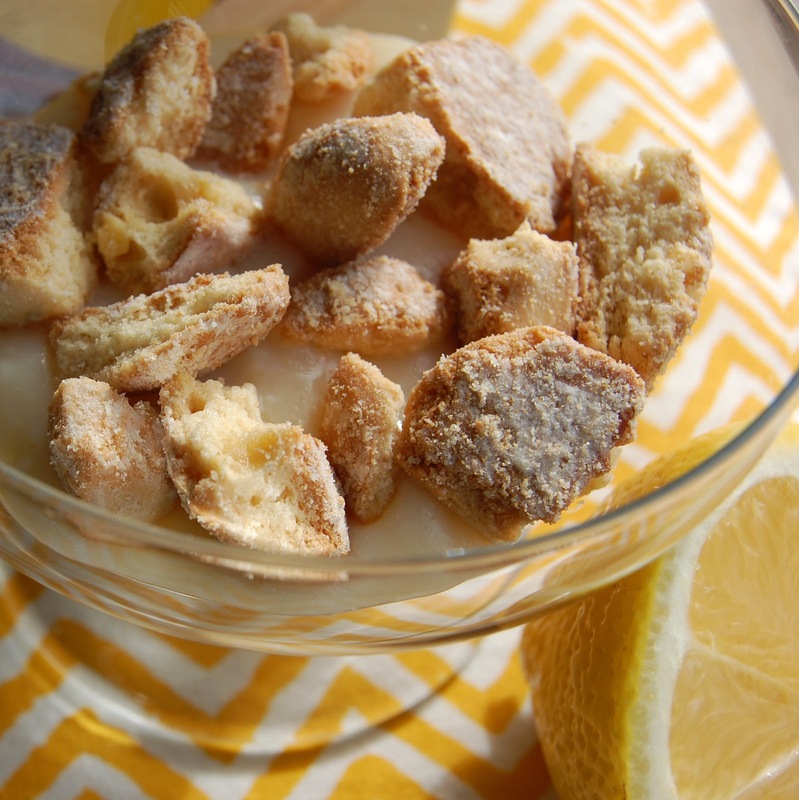 While it is heating, combine sugar, cornstarch, and salt in the bottom of a medium, heatproof bowl. 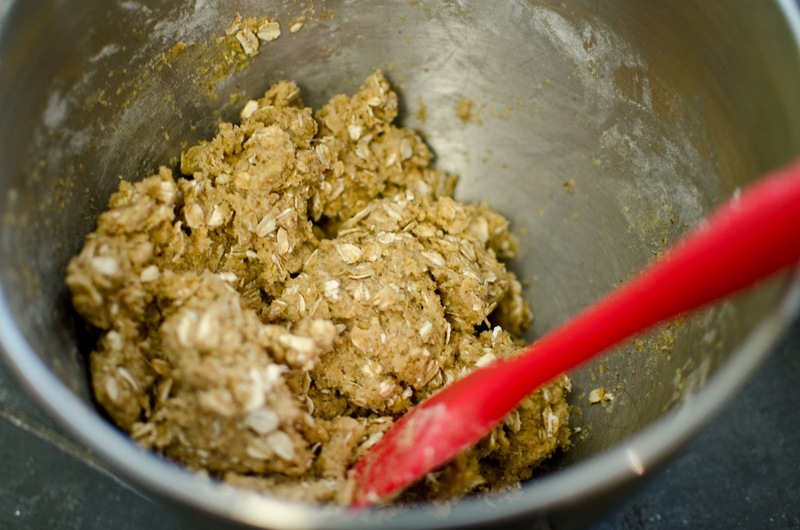 Gradually whisk in the remaining 2/3 cup whole milk, a little at a time so lumps do not form, then whisk in the egg. Once milk is boiling, very gradually add it to the cornstarch mixture in the bowl, whisking the whole time. Return the mixture back to the saucepan, stirring constantly with a silicon spatula or wooden spoon. Once it comes to a simmer, cook it for one minute longer (which will cook the cornstarch and egg fully). Stir in vanilla extract and rum, and pour into a bowl. Cover to avoid skin, and chill for approximately an hour in the refrigerator. While pudding is chilling, crush 3/4 of the cookies in food processor or by hand. Save the remaining 1/4 for garnishes. Then layer pudding and crumbled cookies in individual dishes or one large pie pan. Top with garnish cookies. Enjoy immediately. 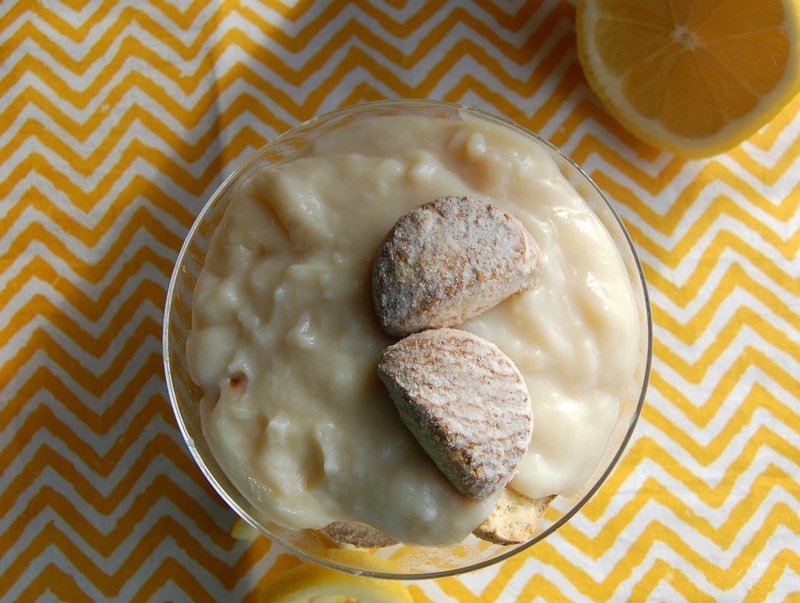 Pudding adapted from the Smitten Kitchen’s Vanilla Bean Pudding. I have a very eclectic selection of cookie cutters. Some of the most random ones include: squirrels and greek letters. These are unrelated. Promise. 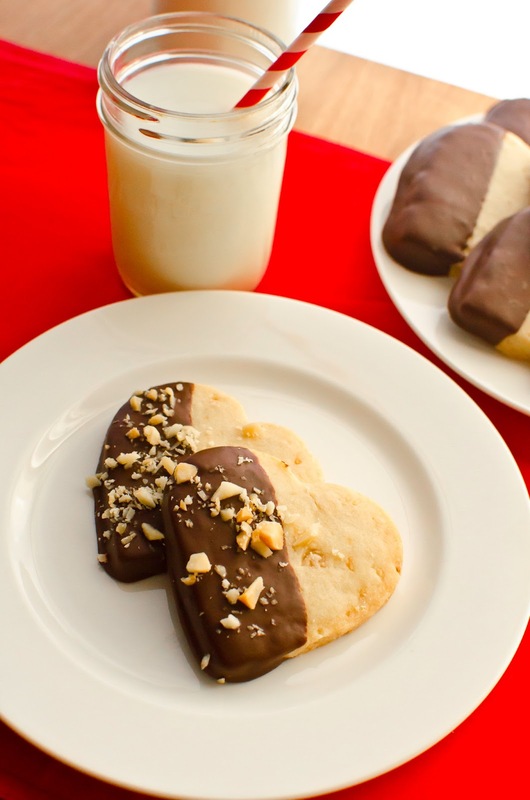 Although the heart cookie cutter is probably the most normal one, it only comes out once a year, in February. Last year for Valentine’s Day I made Conversation heart cookies that my friends and colleagues loved. 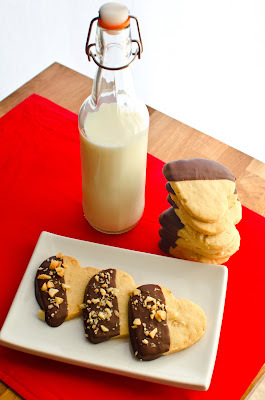 This year I made a personal favorite: macadamia nut shortbread dipped in dark chocolate. I didn’t make up this combination, but I can certainly appreciate it. Cream the butter until smooth. Beat in the powdered sugar and vanilla. When combined, slowly add the flour and beat until incorporated. Mix in the coarsely chopped mac nuts. Pat the dough into a ball and refrigerate in a large ziplock bag or plastic wrap for 2 hours. Heat the oven to 300 degrees F and remove dough from refrigerator. Roll out to 1/4-1/2 inch, and stamp with cookie cutters (or, simply roll into log and slice). Place pieces on ungreased baking sheet, and bake for 20 minutes or until the cookies turn golden around the edges. Remove from oven and place cookies on a cooling rack. In the meantime, melt the chocolate and shortening, and dip (or drizzle!) over cookies. Sprinkle with finely chopped mac nuts, if desired, and let cool. There’s nothing like a little comfort food when you’re feeling far from home. One of my favorite family recipes – and a total comfort food – is an Oatmeal Wafer Cookie recipe from one of my (four) grandmothers. 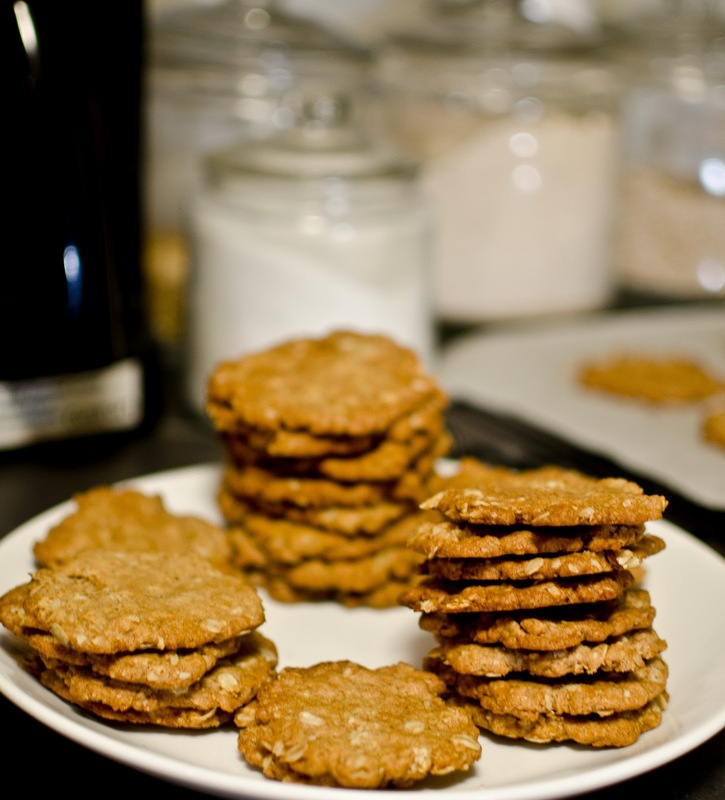 As far as oatmeal cookies go, this recipe makes an unusually crunchy, raisin-free version. Pair this crispy treat with a glass of cold milk and I promise that you’ll be comforted, too. Heat the oven to 350F. Cream the butter and sugars until light and fluffy. Stir in the beaten egg. Mix the salt and baking soda in with the flour, then add the flour 1/4 cup at a time, stirring only enough to incorporate fully. Mix in the vanilla, then gently fold in the oatmeal and wheat germ. Using a wet teaspoon, drop little mounds onto baking sheets lined with parchment paper, spaced well apart. Using the back of a spoon or the bottom of a drinking glass, dip in water and use to press the dough into an 1/8-inch-thick round. Chill 5 minutes in the freezer, then bake until the cookies are a deep golden brown, rotating once, about 12 minutes. Slide the whole sheet of parchment paper off the baking sheet and onto a cooling rack.